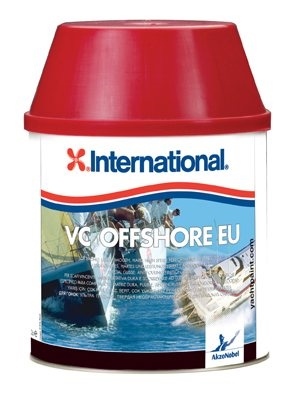 International VC Offshore EU is a strong antifouling suited to power and sailboats. It will dry rapidly to a smooth, hard film meaning its easy to clean. Its the ideal antifoul for enhanced speed and efficiency in the water and in preparation. It is quick and easy to apply with zero sanding needed between coats. You can also be rest assured by VC Offshores flexible launch times. Colours: Blue, Shell White, Black. Size: 2Ltr. Area: Below the waterline Practical Coverage: 9.72 m2/Ltr Finish/Sheen: Matt Substrates: GRP/FRP, Lead, Steel, Wood, Carbon Fibre, Cast Iron Suitable for aluminium: No Suitable for high fouling areas: Outstanding. The only antifoul I will use on my yacht, superb product easy to use, great results. Yes you can get cheaper but, after 20 years "if it ain't broke, don't fix it"